Half way through knitting this baby blanket, at about day 6, I started thinking that I had made a huge mistake. Maybe I should have just knit a wee-sweater instead? Finally, after 10 days of knitting, I had finished my blanket and am now very happy with it. 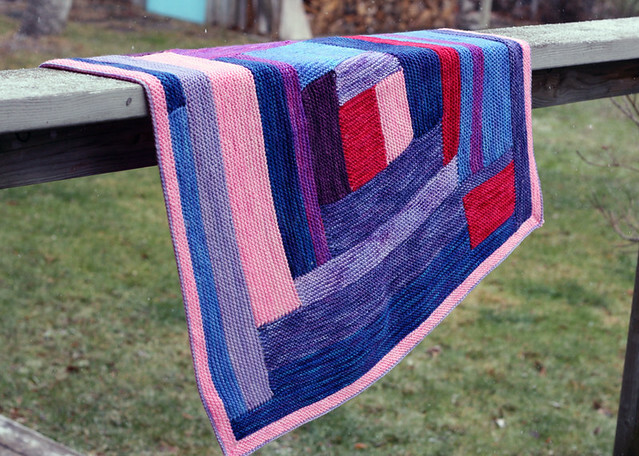 I knit this blanket in TFA Yellow Label DK Weight yarn in all the leftover pinks and purples I had laying around: royal flush, sweet heart, ultraviolet, lilac, jewel, grape and blueberry. It's girly without being too sweet because of the modern chunky stripe style. 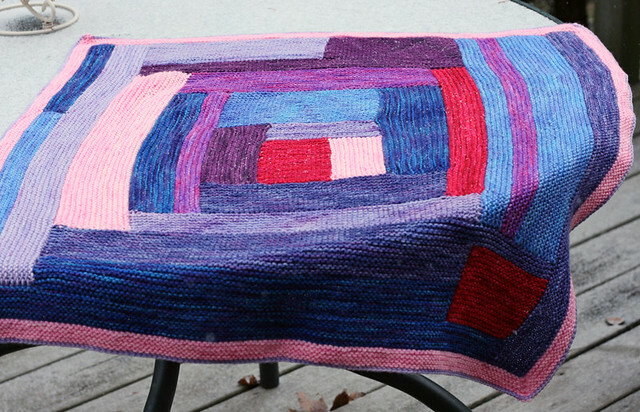 The finished blanket measures roughly 30"square, a very practical, useful size. 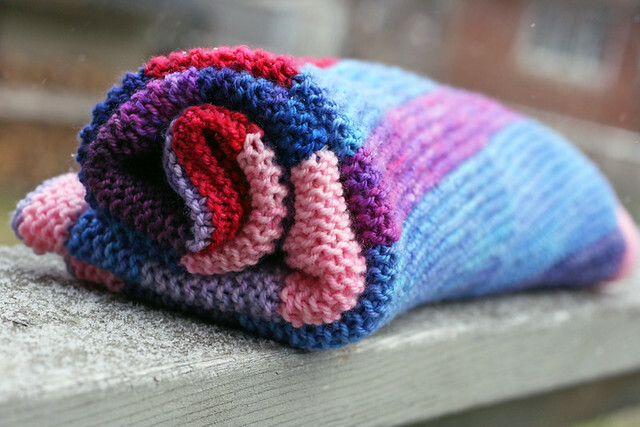 Perfect for wrapping around a little bundle of joy. I was rather proud of myself for finishing the blanket in time for the shower (which was earlier today, the mother-to-be loves her blanket! which makes me a very happy and fulfilled knitter indeed!) I took a couple minutes to wrap the gift up in style before heading off to the shower. I had ribbon and boxes left over from wedding gifts which I used to package the blanket, and then I made a little star that both coordinated with the box and the blanket on the inside to adorn the box. I threaded a loop of purple yarn through one of the points so it can be hung in the baby's room, or on the Christmas tree this holiday season. This is the type of thing that I always wish I had done, but am usually too disorganized to actually do. Lianne made a big deal about the star too, she's a great person to give gifts to, she's very appreciative of things hand-made.